As February is Bird Month and the cold weather is making most of us seek refuge indoors, our little feathered friends are left out in the cold to figure out how to stay warm. Of course they are well adapted to doing this but I’m sure most of you would agree we can make life a little easier for them. Here are some Hints & Tips that you can do to help our little feathered friends out. Make Sure The Food You Give Is Nutritious – Seeds Nuts & Suet balls are formulated to attract most small birds to your garden. 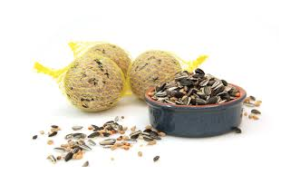 These products contain either high – energy seeds or high – energy peanuts and provide most common birds with the energy they require to survive the colder weather. Choose Feeders Carefully – Not all feeders are equal. Some are better than others at keeping seeds dry. This is important because if the seeds get wet they are susceptible to fungal and bacterial growth. Extra Feeders – With the prospect of snow lingering adding an extra feeder or two would do no harm. This will help when access is prevented to some of their food sources. Top Tip: Some birds are ground feeders and prefer to have seeds scattered in areas such as bushes or anywhere they are most protected from predators. Bird Houses – If you don’t have one, these are a must to keeping birds warm in the cold weather. While it’s true birds don’t nest during the cold months, they will use bird houses for roosting on the cold nights. Try adding some dry grass or wood shavings to the bottom of the house this will help birds stay warm. Water – Be sure to provide a water source. You may want to change the water or empty it at night to prevent freezing. For more information drop into your local Expert Hardware store for all your bird essentials! !